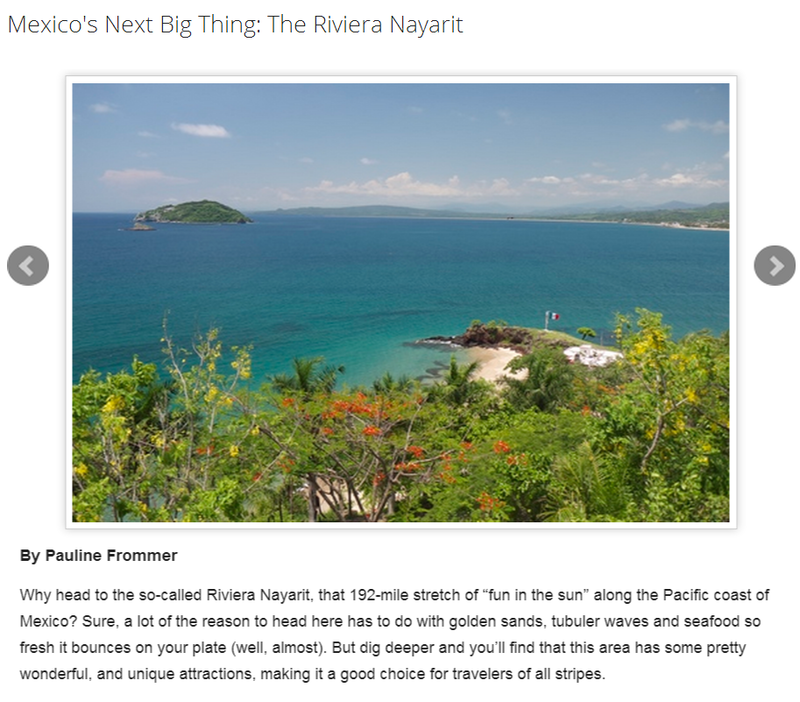 Arthur Frommer’s daughter, Pauline, published an article showcasing the Riviera Nayarit’s top ten special attractions. Having already received the seal of approval from Mr. Frommer during his “Top 14 Destinations to Visit in 2014,” this time the focus was the top ten attractions Pauline highlighted as reasons to visit Mexico’s Pacific Treasure. Among them were the destination’s vast beaches, birdwatching, idyllic colonial towns, exquisite folk art, the Marietas Islands, the relaxing all-inclusive resorts, water sports, its romantic ruins, its coastal surfing villages and its exclusivity and privacy for the rich and famous. “…a lot of the reason to head here has to do with golden sands, tubuler [sic] waves and seafood so fresh it bounces on your plate (well, almost). But dig deeper and you’ll find that this area has some pretty wonderful, and unique attractions, making it a good choice for travelers of all stripes,” wrote Pauline Frommer. The articles on the www.frommers.com portal serve as a tourist guide with a global reach, and they’re systematically sent to different media as well as to interested tourism markets. The site itself has slightly less than 500 thousand unique visitors each month, which means it will give the destination very important exposure, particularly around the European and American continents. Pauline herself was awe-struck at what she experienced in the destination as far as tourism is concerned, and she has committed herself to give the Riviera Nayarit the promotion it deserves. Click here to read the article in its entirety: http://www.frommers.com/slideshows/847954-mexico-s-next-big-thing-the-riviera-nayarit#slide848563.